Deep fried chicken wings can be a delicious appetizer, lunch or dinner alternative. Learn how to fry chicken in the Fry Daddy type fryer here. You just might cringe when you hear about fried chicken wings. The thought of fat and grease can be a scary one in today's health conscious society. If you can learn how to cook chicken wings in a fry daddy, you can actually cut some of the fat calories and enjoy delicious wings. 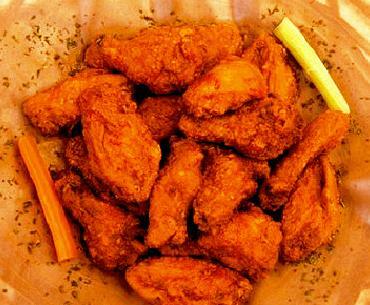 Wings can be prepared a number of ways; Buffalo wings, teriyaki wings, breaded wings and deep fried wings. The wings themselves are actually not high in calories, but the sauces we put on them can be. Improper frying technique can also make deep fried wings higher in fat calories. However, if you develop the proper technique, frying isn't actually as bad as you might think. Proper technique includes making sure the oil is precisely the right temperature, is fresh and keeping paper towels or napkins for draining the oil close by. Deep fried chicken wings can be a delicious appetizer, lunch or dinner alternative. Served up with the right side-dish, they are a welcome change to your weekly menus. You can serve wings with many different things like a dinner salad, steamed vegetables, potatoes and even rice dishes. 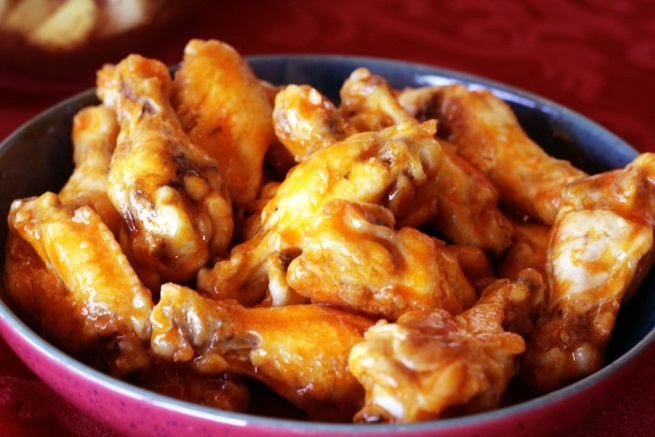 Let's take a look at a few recipes for wings made in the popular Fry Daddy type fryer. Take out your fryer and remove the cover. Fill with oil only to the fill line and no higher. Plug in the fryer and allow to pre-heat for 15 minutes. While the oil is heating, lay out paper towels with baking rack over it to drain the chicken once it comes out of the fryer. Make sure chicken wings are very dry and season pepper and salt to taste. Take your wings and place them into the fryer a few at a time and be sure not to place too many in the fryer as it will disrupt the temperature balance and your wings will absorb the oil. Fry wings for up to 10 minutes and they are done when they have turned light brown in color. Remove wings and place on the cooling rack. Repeat until all the wings have been cooked. Turn on fryer and pre-heat oil to 375 degrees. While fryer is heating, place flour and spices into zip bag and mix thoroughly. Drop in wings then and shake to coat. Leave wings in bag and place in fridge for up to an hour. Next, in a small bowl, mix together melted butter, hot sauce and lemon juice. Set aside until wings are done. Once oil is heated to 375 degrees, begin placing wings in it and fry for 8 minutes or until they are lightly browned and float in the oil. Serve coated with hot sauce mixture, a side of celery and bleu cheese for dipping. Fry Daddy chicken wings are extremely versatile and you can experiment with a number of tasty sauces for dipping. From regular salad dressings like ranch and bleu cheese, to teriyaki and soy sauce, they are all great accompaniments for wings. You can also try different barbeque sauces such as honey barbeque, spicy barbeque and mesquite sauce. They can also be served with a number of different side dishes. You can make mashed potatoes, baked potatoes and even fried potatoes. Flavored rice mixes also work very well with wings. On a hot summer day, they can be eaten with potato or macaroni salad. Make sure chicken is well-cooked. The internal temperature of chicken needs to reach at least 165 degrees F to be safe to eat. Undercooked poultry can contain bacteria that can cause food poisoning with the symptoms like nausea, vomiting and diarrhea. Make sure you heat your oil to a high enough temperature and cook the chicken until the juices run clear. Use caution with hot oil and fryers. Heating oil in a fryer and cooking with hot oil and cold foods can cause the oil to splatter and may cause burns. Always stand a safe distance away from the fryer when try Fry Daddy chicken wings or other kinds of foods and never let small children fry foods themselves. Use a slotted spoon or tongs to remove foods from the fryer. Make sure food is completely dry and free of water droplets, as this will cause splattering and burns. Keep foods warm in the oven until ready to eat. Once you have fried your wings, place them in a tray in the oven set at 200 degrees F to keep them warm until dinnertime. Bacteria can start building up within a short amount of time. If you decide to cook them early, keep them hot in the oven for up to an hour or refrigerate and re-heat closer to meal time. Use only fresh clean oil. Do not store oil in your fryer. Oil can quickly spoil and become rancid. There also may be leftover food bits from previous uses that can grow bacteria. For best results, always use fresh new oil when frying chicken wings. Urine Output: What's Normal and What's Not?